The island of New Guinea is shared between the nations of Indonesia and Papua New Guinea. Aerial photo of the island of New Guinea. New Guinea is an island of the Malay Archipelago and covers an area of 303,381 square miles. The island, located in the southwest Pacific, is the second largest island in the world and the largest in the southern hemisphere. With human occupation dating back about 40,000 years, New Guinea has a wide range of cultural and linguistic diversity. About 1,000 languages, categorized as Austronesian and Papuan, are spoken on the island. Various political groups of Europe have occupied the island since the 16th century, including the Spanish, Portuguese, German, Dutch, and British. Australia also occupied the island after World War I. Currently, New Guinea is shared by two nations: Indonesia and Papua New Guinea. The western half of New Guinea contains provinces that belong to Indonesia. Western New Guinea first existed as a territory of the Netherlands and later as a UN territory. Indonesia took control of the territory in 1963 its following efforts to eliminate the influence of Dutch powers. The president of Indonesia organized a council of elders who were pressured into voting for the union of western New Guinea with Indonesia. Papua and West Papua are the two provinces of Western New Guinea. Cities of the region include Manokwari and Jayapura. The region covers an area of 162,371 square miles and has a population of about 3.5 million people both from indigenous and immigrant groups. Native tribes in the region include the Dani, Manikom, Hatam, Asmat, Marind, Biak, Bauzi, and Sawi. Other groups include Indonesians, Austroasiatic people, Malays, and Malagasy. Western New Guineans have fought for several years against Indonesian rule of the territory, claiming they had no choice in the 1963 Act of Free Choice. This claim has led to several conflicts between Western New Guineans and the government, and lead to rebellions. Western New Guineans have reported instances of human rights abuses by the Indonesian government. Since 2014, international bodies and organizations have supported the independence of West Papua from Indonesia. The eastern half of New Guinea belongs to the nation of Papua New Guinea, and forms the country's mainland area. The eastern half of the island was previously occupied by the Germans, and later Australians after World War II. Papua New Guinea gained independence from Australia in 1975. Papua New Guinea operates as a parliamentary representative democracy, with Queen Elizabeth II serving as the head of state. 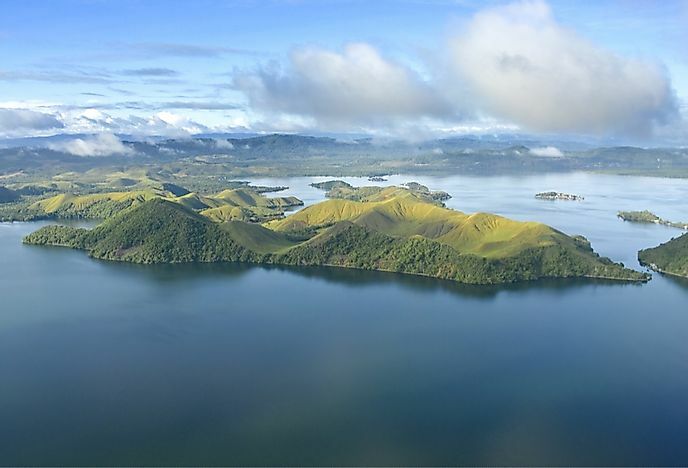 Papua New Guinea has a population of more than 7 million people, and is credited as being one of the world’s most culturally diverse country's, with more than 800 languages spoken within the country. Papua New Guinea is one of the world’s least developed and most rural countries, with only 18% of its population living in urban areas. The country is a developing economy largely reliant on mining and natural resource sectors. The top minerals mined in Papua New Guinea include gold, silver, nickel, and cobalt. Top natural resources include forestry, although their exploitation has led to the rapid decline of forest cover. Papua New Guinea has a mainly rugged and mountainous terrain, which makes accessibility and infrastructural development difficult.